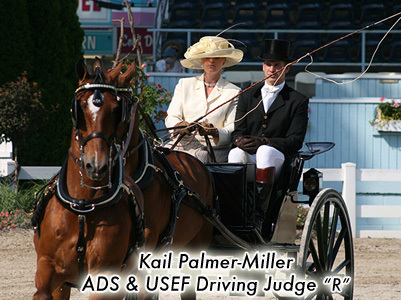 Kail Palmer-Miller, of Chandler, Oklahoma, is a licensed official with the American Driving Society and USEF, holding “R” status in Pleasure Driving, Combined Driving, and Dressage judging. Kail has been involved with carriage driving horses her entire life. She has competed since the age of eight, driving singles, pairs, tandems, unicorns and four-in-hands in both pleasure and combined driving. Upon graduating high school, she studied ridden dressage with Robert Hall at Fulmer International in Aiken, South Carolina. She is a member of the World Coaching Club, an invitational club formed by ladies who are proficient in driving their own four-in-hand and coach. In August 2006, Kail served as Chef d’Equipe and Coach for Team USA at the World Championships for Drivers with Disabilities, held in the Netherlands bringing home an individual gold medal. She also has been the organizer of the Carriage Racing at the Pennsylvania Farm Show since its formation in 2005. Kail has focused her efforts on her family’s team of Hackney horses, which she enjoys showing in the Coaching divisions at the Devon Horse Show and the Royal Winter Fair in Toronto, Canada. She has numerous wins driving in pair, tandem and unicorn classes as well. Kail is the 2010 Coaching Champion at the Devon Horse Show. Most recently she has relocated to back to Pennsylvania after spending a number of years in Chandler, Oklahoma.